I do a lot of work with PowerShell, Git and usually have many things on the go at once. What I really like about Cmder is that you can enable Quake mode which hides the terminal window at the top of your monitor screen and allows a keyboard short cut (Ctrl+`) to show/hide it. Making it very quick to open it over the top of other applications your working in (e.g. VS Code) and run commands. 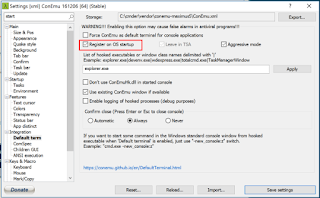 For example, when I am working on development projects I usually have VS Code open to edit the source code files and then I will have a PowerShell or Bash terminal emulated in Cmder for all my Git commands on the repo. Of cause you could just use the Git feature of VS Code in this case, but I usually always find there is some conflict I have to resolve at the Git console so just prefer to work in that. Plenty of other reasons I use Cmder too. To get you started here is my quick setup steps which will set it up at least with Quake mode and your favorite terminal as default. 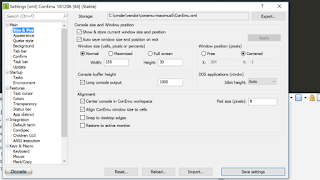 Open Cmder.exe from the location you extracted it to. I have a Surface Book as my laptop which comes with a very large resolution (3000x2000) so I found I needed to change the "Size & Pos" settings, but obviously this is personal preference. Click the Main > Quake style option in the setting menu. Ensure "Quake style slide down" is enabled and any other options as you require. Select the Startup option from the settings menu and select the desired default task in the "Specified named task" drop down. 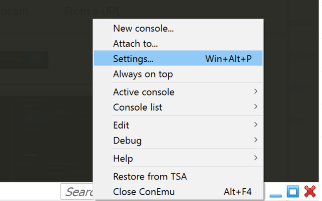 This will give you the option of setting one of the default tasks as your default startup terminal. Such as Cmd.exe, PowerShell, Bash, etc. If you require anything more specific then use the Tasks section to define your own custom task. 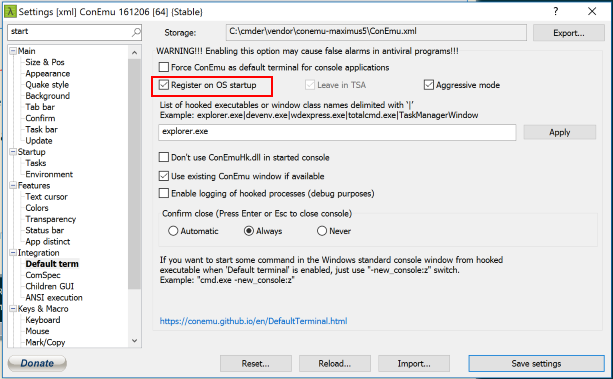 This is handy too for extending the functionality of Cmder, like setting up a SQLCMD terminal or specific PowerShell terminals for different technologies (e.g. Azure, SQL, Exchange, etc). If you want to have Cmder start at logon, something I have found increasingly important as I grew to depend on Cmder for my terminal use. Select the Integration > Default term option in the settings menu. Then check the "Register on OS Startup" option. NOTE: For this setting to work you also need to set the "Force ConEmu as default terminal for console applications", and you will be prompted to do so if you don't check it first. This setting will have no effect without that setting also enabled. Once you have configured the required setttings, such as Task Bar minimisation and other desired behaviors, click Save Settings. Now return to your other applications, when you need a terminal press Ctrl+` (that is Ctrl plus tilt character) and the cmder terminal will load.